We generally prepare morabba from mango, which is the favourite of children for chapAtti and pUri. However, apple, pear, pineapple, straw berry, cherry, mango, Cran/Kiwi berry (KLAkkAi/KarOndA), papaya, ash gourd, carrot, gooseberry and Bael fruit (Bilwa). In this posting, we will first discuss the general procedure and later about mango morabba in detail. The quantity of fruits mentioned below is 1 kilogram. Apple/Pear: Peel the skin after washing well and soak in a vessel filled with water mixed with 2 tsps of ordinary salt or KMS aka potassium meta bi-sulphite (preferable) for about 45 minutes. Remove, just wash under fresh water quickly and place them in a clean cloth. Tie the ends and drop the bundle in hot piping water allowing it to remain there for 5 minutes to blanch. Remove and cool. Prick the fruits in 4 or 5 places. 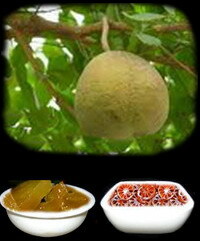 Gooseberry (AmlA/nellikkAi): Wash and place the berries in water mixed with salt or KMS as above for 3 to 4 days. Daily change the water and add salt afresh. After 4 days, just wash quickly under fresh water and blanch the fruits as above in hot piping water. Prick each in 4 or 5 places. Blanching gives the fruits shine. Ash gourd (pUshaNikkAi): Remove the skin and cut. Remove also the seedy portion completely cut the thick white portion into small rectangles of 1 to 2 inches length. Soak in lime water (i.e. add about 60 gms of lime aka Calcium Oxide/ChUnA or ShuNNAmbu, to 1 litre of water) for 6 to 7 hours. Remove and wash under fresh water quickly 4 or 5 times to remove the traces of lime on the surface. 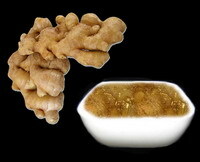 Ginger: Wash, and scarp the skin, blanch, prick in different places and pressure cook. Alternately, you can scrap the ginger finely after blanching. Bael: Remove the hard shell, cut into pieces and blanch in water. Note that the fruit should not be ripened but just ripening. Carrot: Scrap the skin after washing, blanch and prick at different places. Cran/Kiwi berry: Clean, wash and into two to deseed. Blanch. If any of the above like gooseberry, apple, cran/kiwi berry taste sour, then you need not include citric acid crystals. The ratio of fruits to sugar is 1:1 as such take sugar equal to the quantity of fruits. Add sugar to the water. Heat and keep stirring. When the sugar is dissolved and the contents start boiling add citric acid crystals. Five minutes after boiling remove from fire and strain the syrup. Again heat the syrup. When it starts boiling, add the blanched fruit and boil for 10 minutes. While boiling, keep stirring. Add the preservative, i.e., sodium benzoate. Remove from fire and cool. Close it with a tight lid. Next day, separate the fruits from the syrup and boil the syrup only. Boil it to one string consistency. Add the fruits again and boil for 5 minutes. Keep aside, cool for the 2nd day. On the 3rd day, again take out the fruits/pieces and boil the syrup again to 2 string consistency. Then add the fruits/pieces for another 5 minutes. Remove from fire and cool for the 3rd day. On the 4th day, fill in the bottles and seal with air tight lids. In case you prefer, you can add a little essence and suitable colour for the fruits. This entry was posted on April 3, 2012 at 10:58 pm and is filed under Jams, Morabbas, Squashes and Sauces with tags amla, apple morabba, ash gourd morabba, bael morabba, bilwa, carrot morabba, citric acid crystals, cran/kiwi berry morabba, essence, food colours, ginger morabba, goose berry morabba, Jam, Jelly, karOndA, klakkai, Morabba, nellikkAi, pear morabba, pectin, pineapple morabba, pooshanikkai, potassium meta-bi-sulphite, sauce, sodium benzoate, squash, sugar, vilvam. You can follow any responses to this entry through the RSS 2.0 feed. Both comments and pings are currently closed.